I knew I couldn't do a week of Mayer without asking Mercer's biggest fan (and part-time keeper of his Wiki page) to chime in. Meet Robert Brouhard. He likes Mercer Mayer. A lot. When Burgin asked me to do a guest post on here about Mercer Mayer, I had to say a resounding “YES!” His work is a passion of mine and my family. I tend to do a lot of research and get very verbose on my own blog, Book ‘em Bob (which I sadly don’t update often enough), and I’ll try not to do that here… oh heck, I can’t help myself! While collecting Mercer Mayer books over the years (over 430 Mercer Mayer related books are currently sitting on our family’s bookshelf), one eluded me for a long time. Terrible Troll which was first published in 1968. You see, I collect with an extreme budget, and this means I don’t pay over $5 for each book (including shipping) except for the new ones as they come out. I’ve broken this “rule” a couple times on special occasions, but that is very rare. 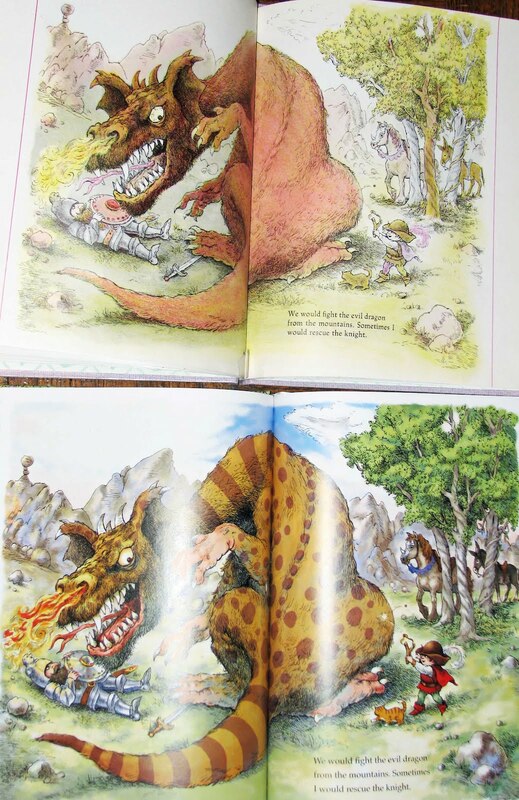 I also try to get hardcovers over paperbacks (library bindings and ex-library books are fine… Little Critter books are the exception, but I’d love to have them all in hardcover, too). 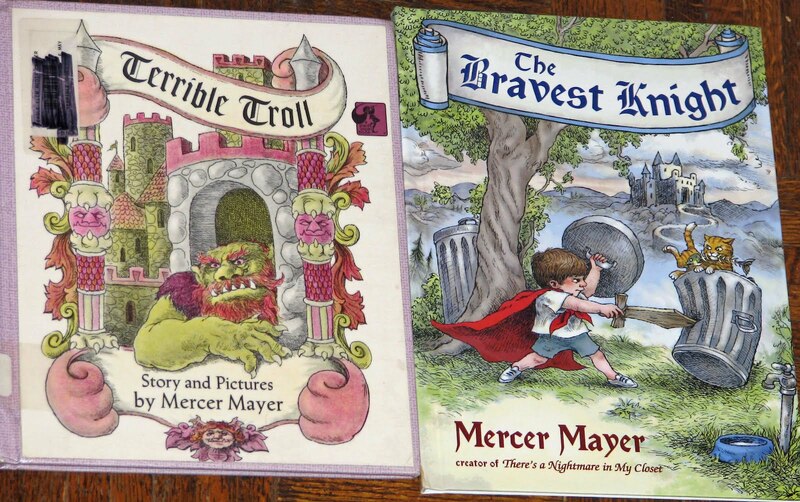 In 2007, I pre-ordered what I thought was a new book from Mercer Mayer titled The Bravest Knight. After receiving the book, I immediately recognized the pictures in it from my youth (and I noticed that it said it was previously published as Terrible Troll in itty bitty print). I was both ecstatic and chagrined at the same time. On one hand, I’d finally gotten the story I’d been looking for, on the other, I now had a conundrum; should I still continue to seek out the elusive original Terrible Troll or be satisfied with what I have? This lasted about… one minute. I continued my search, and about a year later, I found a slightly ripped ex-library hardcover copy for $1. Unlike many of Mercer Mayer’s earlier works, I never ran across this one growing up except as a film strip (remember those?) around 1982/1983. 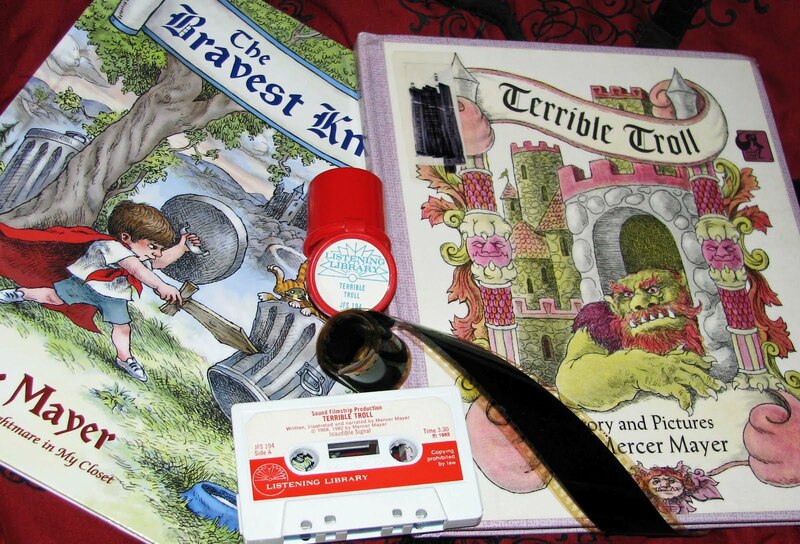 We watched a few Mercer Mayer film strips in my class (1st grade or 2nd grade, I can’t remember), and they were all narrated by Mr. Mayer himself (some even started with a picture of him... with a pipe!). 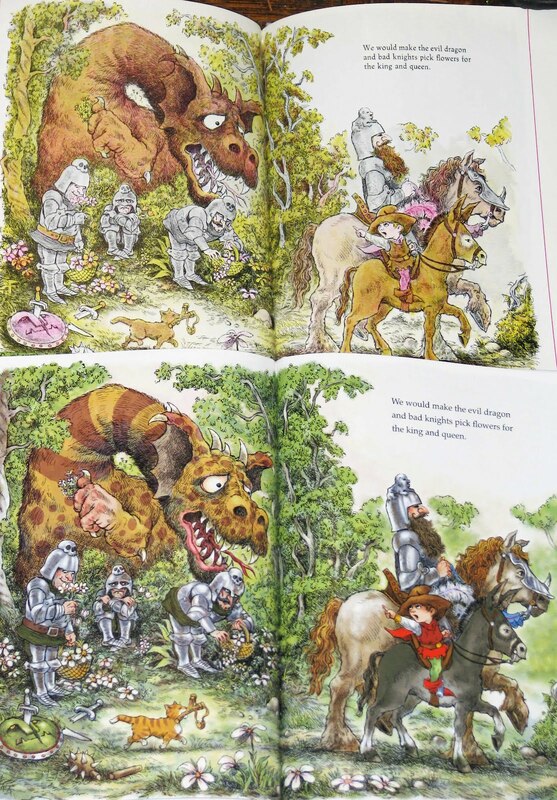 When I first read this book to my children, I could still hear Mercer Mayer’s voice reading it. The story involves a young boy who has a great time imagining what he would have done as a squire assigned to the bravest knight of the land. Bad knights would be fought, a fire-breathing evil dragon would be taken care of, and a kitty would be saved from a tree… all in a very family-friendly way. What was the fate of the dragon and bad knights you ask? We would make the evil dragon and bad knights pick flowers for the king and queen. Awwww. 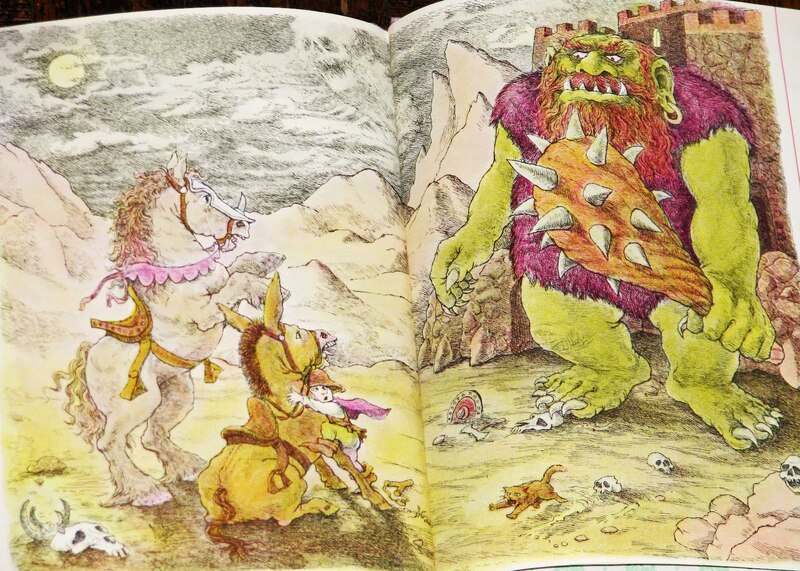 Eventually, the knight and squire are asked to get rid of the terrible giant troll by the king and queen. 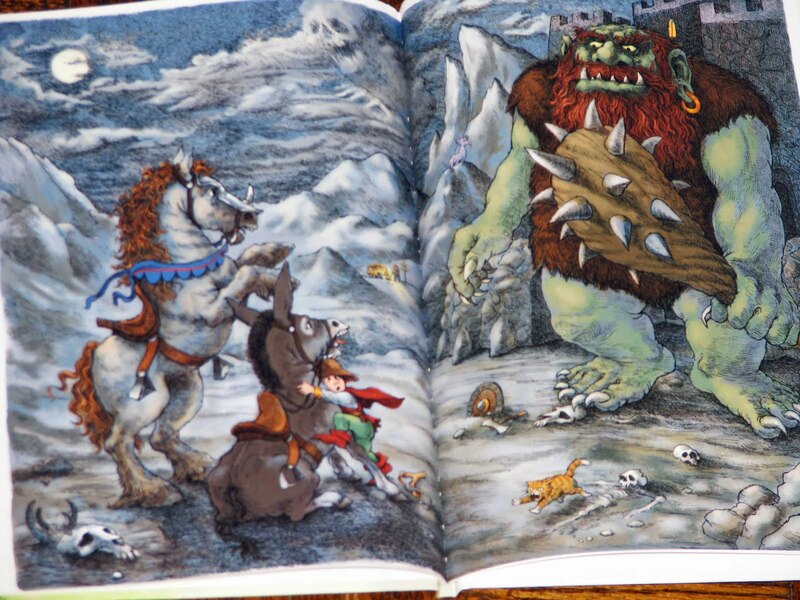 Note: The troll’s castle is surrounded by skulls and bones from humans and horses! There’s even an almost complete skeleton of what looks like a very short person. Not something you’ll see in a lot of children’s picture books nowadays. The battle would last all day. When night came it would be very quiet. Finally the winner would come out. And then comes the shocker! The bravest knight lost. Yes, he actually died, but the book doesn’t spell it out… so some kids won’t let it bother them. Not only that, but it looks like the young squire might be next because the huge menacing troll has emerged from his castle! Again, not something you’ll see in most children’s literature nowadays. To top it off, there isn’t any happy kid-saves-the-day moment, either. No David and Goliath. No trick-the-monster into falling off the beanstalk. The modern day child just abruptly stops his fantasizing at this point and says, I’m glad I don’t live a thousand years ago. So, everything is all right, and we can leave this book knowing it is okay to imagine scary things sometimes because if things get too scary, we just stop our imagining. I forgot to mention, like Mercer Mayer’s future books, the boy’s companion kitty cat appears on every page of art in this book. This is very similar to how Little Critter’s companions – the spider, grasshopper, and mouse – appear on (almost) every page of his stories. As I said, Terrible Troll came out in 1968. 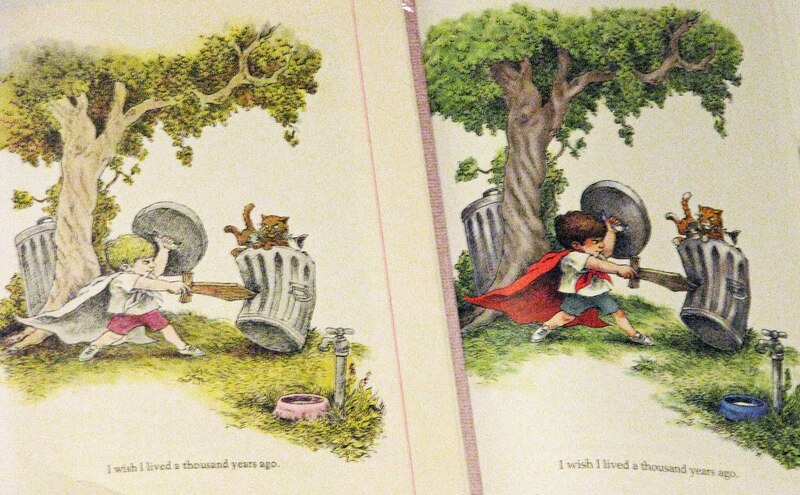 It was one of Mercer Mayer’s first colorized children’s books. That being said, the colors are very muted and almost seem washed out. The boy is fair-haired (blonde). The 2007 version is totally re-colorized, and the boy now has dark brown hair. The re-release colors are rich, bright, and very fun. Most likely, they were re-colored with a computer. To my mother and father, my favorite trolls. The other weird changes (again, easy to miss) are in the climactic scene, Mercer Mayer added a couple things to the background that weren’t there at all in Terrible Troll. At least, I assume Mercer Mayer added them. One is the dragon (who now looks kind of pink) from earlier in the book standing far far away on one of the mountain peaks. The other is a yellow Van (or maybe it is an International brand Scout II), a confused-looking man in a hat, and a crossroads sign that points to our left saying “Home” and our right saying “on and on” (you might need a magnifying glass). Is this a reference to something? I have no idea. Plus, I have no idea why it was added. The man is sort of comic relief from the horror of the scene, I guess. My life is happily surrounded by books. Through their art and storytelling, Mercer Mayer’s books are a great gateway to far off fantasy lands, and my family happily travels with him there as often as possible. Thank you, sir, for that. And with that, we shall go back to reality. Good night, sleep tight, don’t let the Zipperump-a-zoos bite. That was so interesting! Wonderful guest post, I loved seeing the side by side comparison of the two books! I tend to compare a lot of Mercer Mayer's re-releases... because "things change." I love this! I am totally getting the old one. Already in the mail! I feel everyone should have the "classic" Mercer Mayer books. We love this book so much! I love seeing the comparison between origional and new version- thank you! Mercer Mayer is the best! What an excellent, informative guest post! Thanks!